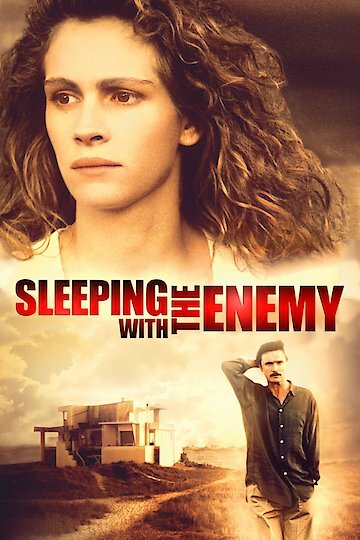 Sleeping With the Enemy is a movie about a woman who is married to a very abusive husband. She is physically abused by her husband over the tiniest of things due to his OCD, and she must decide what she is going to do. She knows he will never let her just leave. He is far too controlling for that. She devises a plan to escape him by taking swimming lessons unbeknownst to him; he still thinks she can't swim and is terrified of the water. She plans her own death for when they go out on his boat. She is presumed dead by the police when a search for her body turns up nothing. Her husband has no reason to believe that she isn't dead and is devastated by her death. As she is starting a new life in a small town under a new name, her husband finds out the truth that she is not dead. He sets out to find her no matter the cost to make her pay for her deception. He begins a quest to locate where she is and what she's doing. While he is searching for her, she is beginning to let her guard down in her new life. She is, for the first time in a long time, enjoying who she is and where she's at in life. She even lets herself fall for a shy, down-to-earth college professor in town. Her husband finds her by tracking down her mother to a nursing home. He finds that she is in a small town in Iowa and soon realizes she is in a relationship with another man. He leaves her a clue that he has found her by straightening her towels in the bathroom and then the canned food in the pantry. She must then find a way to escape him once more, or else lose her life. Sleeping with the Enemy is currently available to watch and stream, buy on demand at Amazon, Vudu, Google Play, FandangoNow, YouTube VOD online.